SIPs are breathing new life into the mutual fund sector. Here's why you should consider them. Warren Buffett may not know it, but a diamond trader in Mumbai follows his advice very closely. Ashwin Singhania, a meticulous planner, has allocated 25 per cent of his earnings into equity, breaking away from the tradition of investing in just gold or real estate. He is among the few who abide by Buffett's words: "It's a lot better to have a goose that keeps laying eggs than a goose that just sits there and eats insurance and storage and a few things like that." Singhania is a happy man today, reaping a CAGR of 15 per cent at the end of 10 years. "I have regularly invested my money in SIPs since 2007. Initially it was tough to take this decision, but I wasn't comfortable with direct equities and SIPs was a safer method in the madness to get better returns," says the 44-year-old South Mumbai resident who has a family of five. Like him, many have taken recourse to the systematic investment planning (SIP) route. SIPs have existed for long but have gained popularity recently. Navneet Munot, CIO, SBI Mutual Fund, says, "From early 2014, post elections, we observed an overall macro recovery and positive flows into equities through the SIP route." He reiterates this with figures from the Association of Mutual Funds (AMFI) that point out an increase in the last four years alone - mutual fund assets under management (AUM) have doubled from Rs 5.87 lakh crore as on March 31, 2012, to Rs 12.3 lakh crore as on March 31, 2016. The total AUM of the MF industry in the last ten years has seen a five-fold increase from Rs 3.26 lakh crore as on March 31, 2007, to Rs 17.83 lakh crore as on Jan 2017. AMFI's chairman, A. Balasubramanian, points out that it was at the end of 2012 that authorities took to spreading awareness and education in increasing the penetration of mutual funds. "SIP became the game-changer when it got an aggressive push and started becoming an acceptable way of investing. 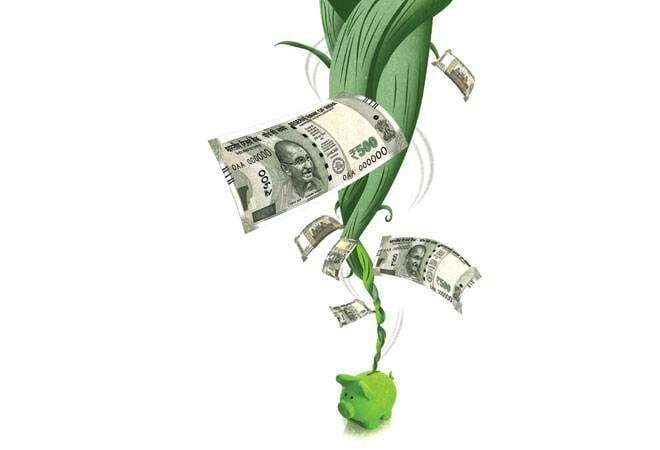 The SIP count has risen from 58 lakh in 2012 to 1.25 crore today. This rise in customer base is an alpha change." These numbers signal that investor confidence is building up, and that investors are not erratic anymore. 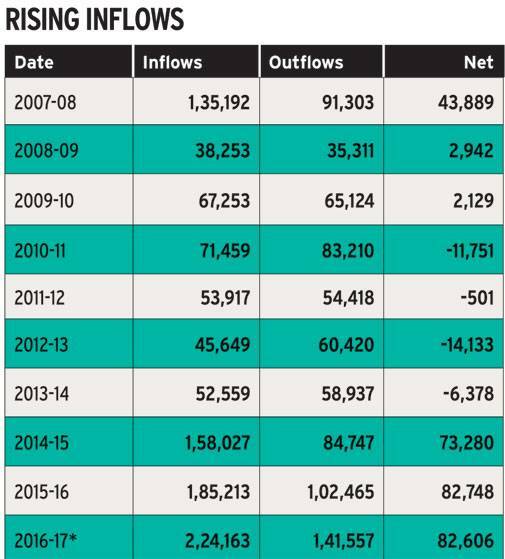 The shift is such that SIPs now attract a little over Rs 4,000 crore every month as opposed to Rs 1,000 crore three years ago, enabling domestic institutional investors (DIIs) to begin providing a counterbalance to foreign institutional investors (FIIs) outflow. Dhirendra Kumar, CEO, Value Research, says a reliable and robust system is being built. 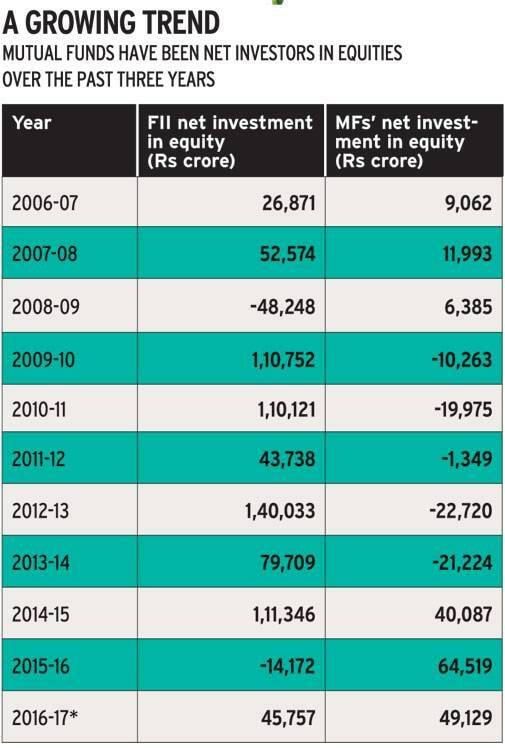 "In 2008 when FIIs pulled out, we went into a tailspin, but now DIIs can contain the fall." This was indeed evident when we saw markets holding up after mega events like Brexit and Donald Trump's victory coinciding with the news of demonetisation. That indices could tide over such news without the support of foreign money is in itself a change, say analysts. Securities Exchange Board of India (SEBI) data shows that from the beginning of November to the end of February, FIIs had sold shares worth Rs 24,504.51 crore while DIIs had bought shares worth Rs 32,852.32 crore. What is bringing about this big shift? As Balasubramanian points out, SIPs have played a pivotal role. From just Rs 980 crore per month in 2012, the incremental growth has been phenomenal in the past four years. It is now Rs 4,200 crore each month. This of course speaks of a design that is very reassuring as it is the retail investor's money that is pouring into equities asset class, a phenomenon hitherto unseen in such an organised fashion. Apart from the incremental increase in SIPs, lump sum money is also a contributing factor. While SIPs work on the principle of continued and regular investments, like a recurring deposit, lump sum is a large chunk of money given at a single time. Lump sum continues to make its way into the mutual fund industry. Balasubramanian explains, "On incremental growth, SIPs contribute about 45 per cent and lump sum share is about 50 per cent." Of the total AUM size of Rs 18 lakh crore, Rs 5.2 lakh crore alone comes from the equity channel, Rs 3 lakh crore is liquid funds, while the rest is fixed income schemes. Fund managers say, lack of superior returns from other predominant channels is another key factor that has brought about a change in the consumer's mind. Gold has not given stellar returns and has a cost of carriage. The price of the yellow metal has been almost stagnant at an approximate Rs 29,000 per 10 grams in the last two years, disappointing investors who think of it as a safe haven. Meanwhile, real estate, too, has not been positive for investors. After the lull of 2015 when sales dipped sharply, the industry has had to bear the shock of demonetisation. While the distressed ongoing projects are being revived and regulatory frameworks like Real Estate Regulatory Authority (RERA) are expected to bring about transparency and accountability, it will take time. The launch of Real Estate Investment Trusts (REITs) could also be a much-needed shot in the arm for the industry; but until then it is mutual funds all the way. Further, Rajeev Thakkar, CIO, PPFAS Mutual Fund, observes that public provident funds (PPFs), National Saving Certificates (NSCs) are not so alluring any more. NSCs currently offer 8 per cent and the rate of return remains the same during the entire tenure of investment and it is taxable. PPF offers a return rate of 8 per cent. It is an ongoing account in which a minimum deposit has to be made every year. Bank deposits, too, are at about 7 per cent and less, and that too taxable. Besides these instruments, fixed deposits (FDs) are also losing sheen as investment instruments over the past few years. FDs comprised 6 per cent of financial savings of households in FY 2011-12 and declined to 4.7 per cent in FY 2015-16. As per an RBI annual report of FY 2015-16, FDs stood at Rs 104 lakh crore in August last year (CY 16) growing at about 9-10 per cent for three years. Amol Joshi, Founder, Plan Rupee Investment Services, says, "FDs worth Rs 40 lakh crore is up for renewal by the end of this calendar year, out of the total deposit size of Rs 100 lakh crore. We are almost certain that in this low-interest-rate environment, some of the volume will find its way into mutual funds, both for returns as well as tax efficiency, and we will start them off with balanced funds." Another factor driving money into mutual funds is the measure that the government of India has taken towards transparency. Thakkar says, "It is not just demonetisation but the linkage of Aadhaar card, mandating PAN card details for higher transactions, decision to roll out GST and now a central Know Your Client (KYC) procedure which is already in motion that would compel investors to channelise their money into the formal economy." The question that arises next is: where and how are mutual funds deploying the inflows. "We focus on bottom-up stock picking. We look at companies that have a strong competitive advantage and can create wealth for investors. We focus on robust processes and discipline, and look at risk adjusted returns with a long-term orientation," says Munot of SBI Mutual Fund. But for first-time investors who have an innate need to protect their capital, the money is put in balanced funds, says Joshi. Balanced funds have a 65 per cent equity exposure and 35 per cent debt. He adds, "Debt funds qualify for indexation benefit for a holding period of three years and significantly reduces the tax liability." A few balanced funds have seen their asset under management grow manyfold. For example: In the last one year from February 2016 -2017, Birla Sun Life Balanced '95 Fund AUM has grown by 194 per cent and ICICI Prudential Balanced Advantage has seen inflows rise by 76 per cent. Crisil Research states that private banks, software, finance, pharmaceuticals and auto were the top five sectors which drew investments from equity funds as of February 2017. "The banking sector is aligned with fortunes of the economy and if the economy grows, banks are inevitably the primary beneficiaries. They also have high potential as their financials are healthier than most PSU banks, which is why banks continue to be a priority choice of fund managers," says Joshi. Other than this, he says, small and mid-cap schemes have seen a good run, and many fund houses have restricted fresh inflows into them. "At SBI, we have a restriction of Rs 750 crore in small caps and that has been exhausted for now," Munot shares. Few fund houses have also changed their mid-cap mandates to flexi schemes and are waiting to pour in the money in fresh issuances and even large caps. Essentially, while people are ready to invest in MFs, the funds could do with a wider range of companies to invest in. Are better investment options on the horizon? Hopefully. Thakkar says, "Companies are growing and with time, they will need to raise capital, too. A lot of them haven't even seen the light of day. Private insurance companies, for example, are not listed; same is the case with Indian Railways or the defence space." Dhirendra Kumar cautions against an impending bubble, since there is too much money chasing one asset class. But the tide is undoubtedly turning with mutual funds finally being discovered by retail investors.